Where to sleep with my RV in Canada ? Naturally, the best place to spend the night in your RV is in a campground. 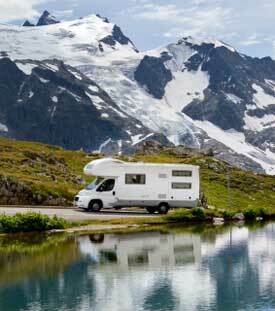 However, some travellers prefer to save money by finding free locations to park their RV for the night. Don't forget to ask for the manager's permission before settling in. Note that you will not be allowed to open any extensions/slide-outs. You should also note that not every Walmart store allows overnight parking. Refer to this list of Walmart stores to find out which ones accept RVs. It is important to note that it is prohibited to spend the night in roadside rest stops in Canada. The maximum stay permitted is 1 hour. You may decide to risk it, but there is a good chance that you will be woken by the police in the middle of the night and asked to leave the premises. This is an unpleasant way to start the day and does not make for a very restful vacation. Apart from these 2 suggestions, there are many other possibilities, all of which can be attempted at your own risk. To make the most of your vacation, the best choice by far is to reserve a site in a campground. There are options to suit every budget.